Come learn and stimulate the mind with topics ranging from Hebrew 101 to High Holidays. Offered on different days of the week by variety of speakers to match various schedules. Nurture your mind and your spirit! Drop in any Shabbat morning to pray and study with a wonderful group of people. We meet every Saturday at 9:00 am with Rabbi Marc Berkson, Rabbi Toba Schaller or Cantor David Barash. Join other adults to learn, and re-learn, Hebrew and become B’ne Mitzvah, if you choose, at the end of this two year cycle. 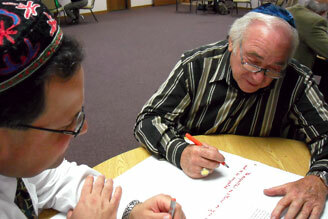 Work on a weekly basis with the Rabbis and Cantor to study Torah and learn Hebrew for life cycle events and services. A one hour program around a current theme is led by clergy. Bring your lunch and drink and enjoy a thoughtful discussion with other members. Have a topic suggestion or conference room to host the group? Please let us know. This once a month class is a program led by Rabbi Schaller, who leads the discussion around current event topics. Challenge yourself through the month to consider the theme through ritual, community and social action. A basic curriculum format was developed to discuss historical and current day meanings. Chai Mitzvah is a way to reconnect, recharge, re-examine your Jewish life. Learn more through www.chaimitzvah.org. This annual weekend hosts a special nationally renowned Rabbi to share his/her wisdom throughout the weekend. 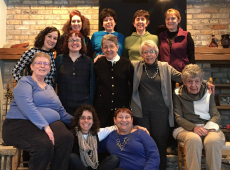 Once a year, an inter-generational group of CEEBJ women gather for a day in a relaxing setting away from life’s routine. This day-long retreat has prayer and learning time, craft time, sometimes a debate or two, along with lunch and lots of snacking! Watch the calendar for the next scheduled retreat.